All branches offer color laser printing, as well as black and white. Black and white prints are 15 cents per page, color prints are 25 cents per page. 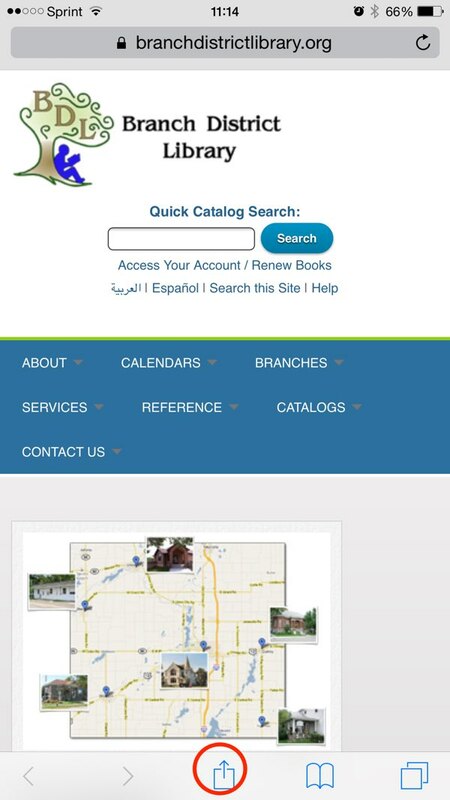 You may print from either library computers or your own portable devices (At all Branches except for Algansee, which is coming soon). Printouts may be retrieved at the service desk. Please note that all unclaimed print jobs are purged each night at 9:00pm. Apple's AirPrint is by far the easiest way to get printing at the library. 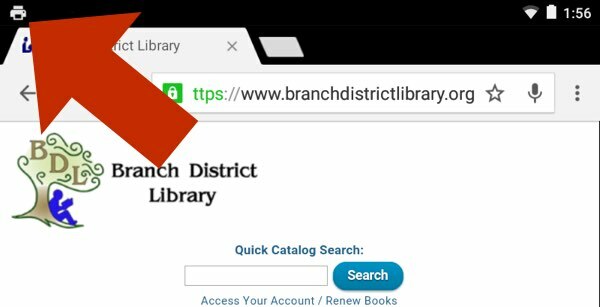 Be sure you're connected to the library's wireless network, "Branch Dist. Lib. Public Access", before you try to print. Printing from Apple devices will work only if you are on the library's wifi network. Printing Photos? If so, we highly recommend you use the free PhotoPrint LT app. Unlike the stock Apple Photos, PhotoPrintLT will let you choose your paper and print size. On iOS devices (Apple mobile devices like iPads and iPhones), you don't have to do anything to set up the printer. On any app that supports printing, find the "Share" button, which normally looks like or . 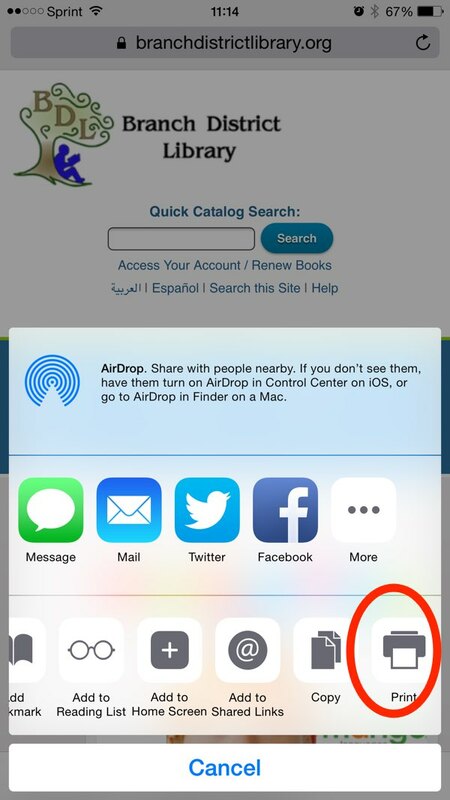 A menu will pop up; find and tap on the "Print" icon, as shown at right. On the next screen, you'll see our printer. 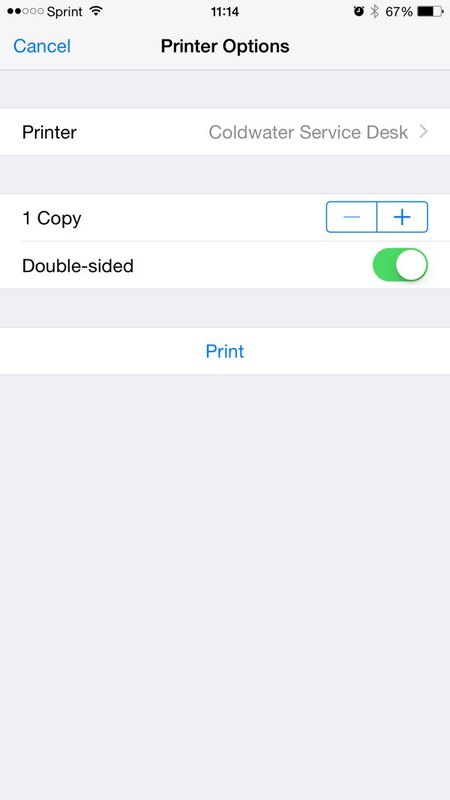 Set the number of copies, whether you want double-sided, and tap on "Print". On a Macintosh laptop, you'll need to add our public printer. 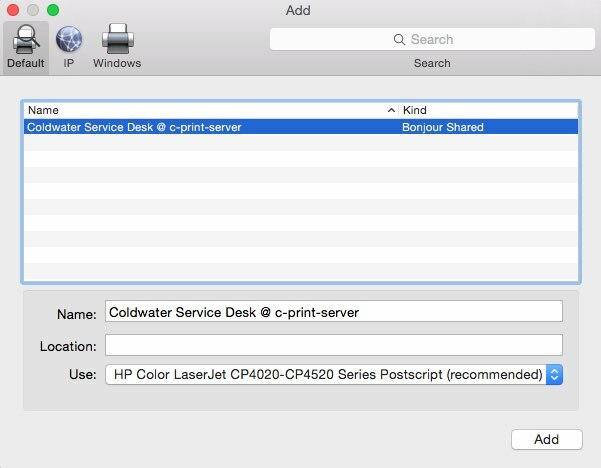 Open System Preferences, go to Printers and Scanners, click the + button, and you'll see the library's printer listed as "[Branch Name] Service Desk Printer". Click add at the bottom right of the window and you're done. The printer will now be accessible from any program that can print. Printing via Google Cloud Print requires you to first have a Google account and know your Google account password. If you are on a platform other than Android, you may need to create a Google account first if you don't already have one. 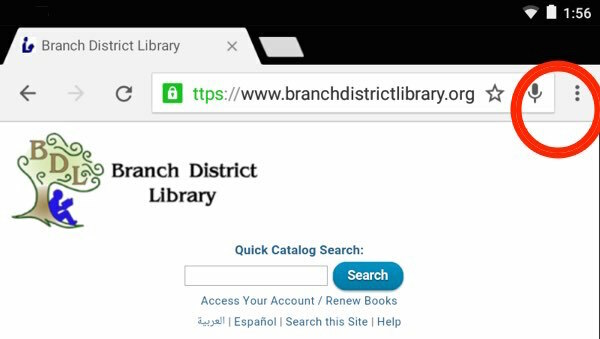 Next, you'll need to click one of the links below to add one of the BDL printers to your Google account. 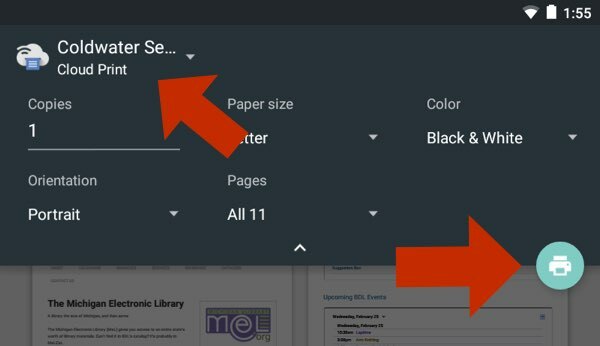 You can do this from any computer or mobile device; it doesn't matter, added printers will show up on all your Google-connected devices. 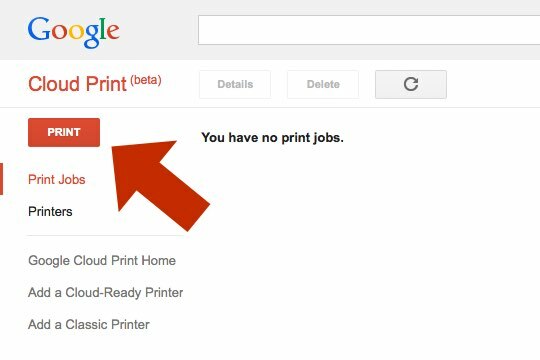 Simply click on "Add Printer", and the printer will be added to your Google account. Important: make sure that Cloud Print is enabled after you install it. Go to the Settings App on your device, then go to Printing. Turn on Cloud Print if it is off. If there is not a "Print" menu option, try "Share". Often, under share is the option for printing. Next, you'll see a screen that shows your printer (tap where it says Cloud Print to switch printers if you need to). Change any parameters you want, then press the printer icon on the bottom right to send the print job. You'll see a little printer icon appear in your notification area. It will disappear once the print job has been sent. Because Kindle Fires use the Amazon App Store, and not Google Play, not all of Google's recommended apps are available. However, Fiabee is free on the Amazon App Store and will work with Google Cloud Print and BDL's printers. Please note that the Fiabee app can print only documents you upload from your device. It is unable to print web pages. You can print from Windows 3 different ways, once you have added the library printer to your Google account as detailed above. You can install the Cloud Print Driver for Windows. 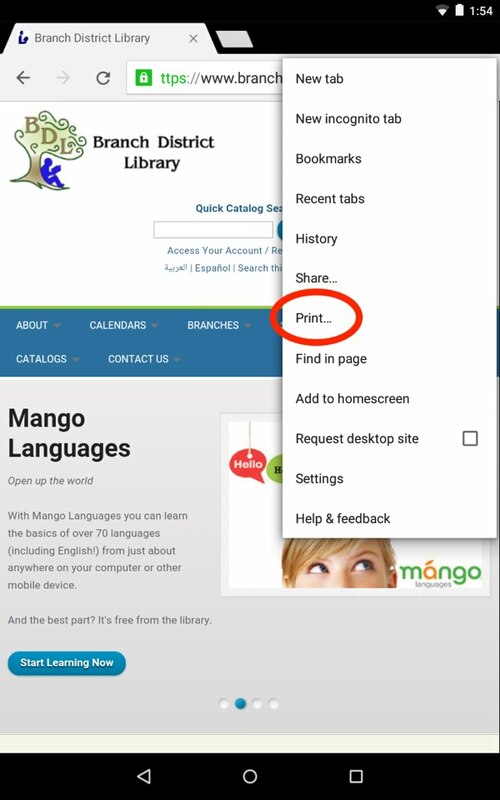 This will create a new printer on your system that will be able to send a print job to the library printer from any program on your computer that can print. NOTE: You will need to install the Cloud Print Driver from the Google Chrome web browser. Log into your Cloud Print Control Panel. Click on the red "Print" button as shown below to upload a file to print. You can print common document and image formats this way, though not all types of files. Cloud print may be used on Apple mobile devices from the Google Chrome web browser, from some Google mobile apps (like Google Drive, and from PrintCentral Pro. From a Macbook print by logging into your Cloud Print Control Panel, same as with Windows above.